Sweet Potato Pie Made with Guilt-Free Wholesome Ingredients!! This Sweet Potato Pie has all wholesome ingredients – unrefined grains, vegetables, nuts, seeds, fruit, quality sweeteners, etc. Because it has hearty ingredients with concentrated sweeteners and it;s cooked well, this is one dessert that is healthy (when eaten in moderation, of course)! Everyone will love this delicious sweet potato pie, and they will never guess it’s made with all wholesome ingredients – even the crust! It’s easy to make, too. Serve this to your guests and watch every single one eat every bite, then ask you for the recipe! So, let’s dig right in…. Prepare pie crust (recipe below). Preheat your oven to 350 degrees. While you’re waiting, mash the sweet potatoes and mix in all ingredients in the list above. Fill the pie crust just below the edge and bake for 35-40 minutes. It will puff up a bit and then fall slightly once it’s out of the over and starting to cool. No worries! That’s normal. Preheat oven to 400. Combine dry ingredients. Rub oil in with fingers. Add just enough water so the dough holds together but is crumbly. Press into a lightly floured pie pan. Flute edges. Prick well with fork. Bake 10 – 12 minutes or fill with pie filling and bake. 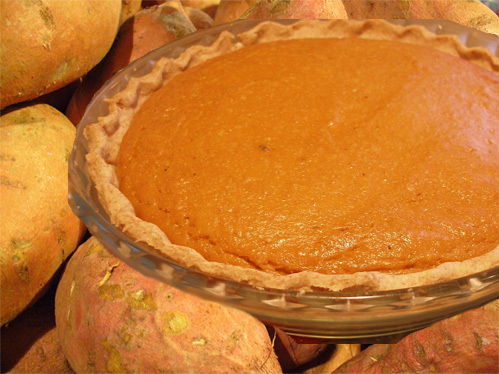 Of course, this crust can be used for other pies, not just the sweet potato pie! Once you taste this treat, you’ll prefer this pie crust to any others. After all, it’s so much healthier than the other kinds!